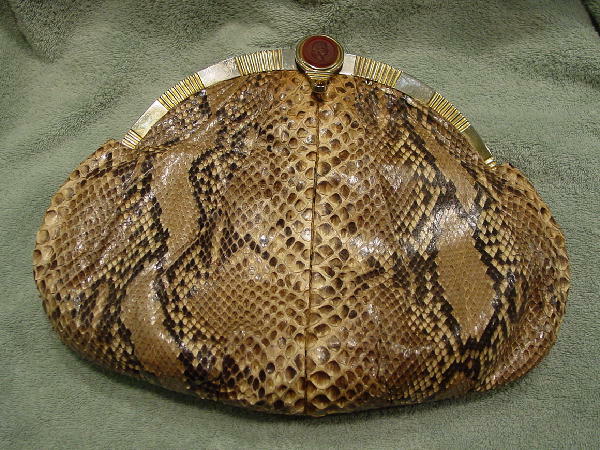 This snakeskin large clutch purse is a vintage Judith Leiber. There is a tarnished gold-tone rim, which has an alternating pattern of a smooth area and a high-low ridged area. The center clasp-lock has a center reddish faux stone with an elevated profile of a person in the center. It is surrounded by a gold-tone ridged area and below that are 3 high-low horizontal ridges with a smaller circle with a tiger's eye stone in the center. The inner side of the clasp has snakeskin on it. 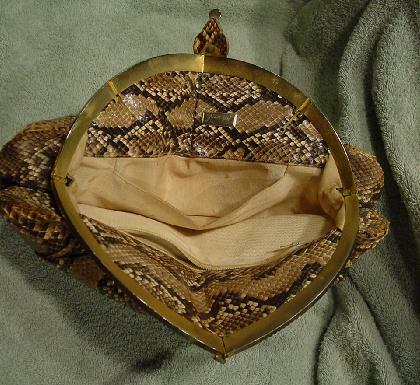 The interior of the purse has a 3" C center area extending outward to 1" of snakeskin on both sides. 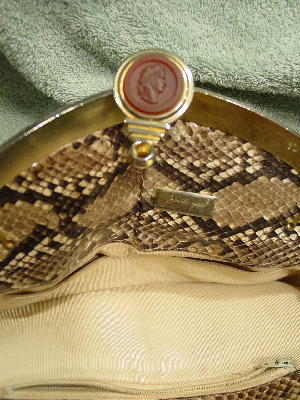 A gold-tone tag with Judith Leiber © etched on it is in the back side of the interior. Below the snakeskin is a thick grosgrain type cream color fabric lining. The back side has a large open pocket and the front side has a large zippered pocket. The lining has various makeup stains and some age spots. You could attach a chain strap. The scales are in dark brown, light and medium brown, bone, and taupe. It's from the siteowner's personal collection.